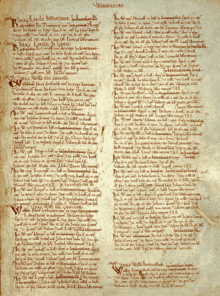 "The Domesday Book records over 200 manors given to Henry de Ferrers"
Henry de Ferrers (died by 1100), magnate and administrator, was a Norman who after the 1066 Norman conquest was awarded extensive lands in England. He was the eldest son of Walkelin de Ferrers and in about 1040 inherited his father's lands centred on the village of Ferrières-Saint-Hilaire. In England he progressively acquired landholdings, which he had to manage. As one of the leading magnates, he also served King William I of England and his successor William II in administrative capacities and is said to have been castellan of Stafford Castle. In about 1080, he and his wife founded Tutbury Priory and in 1086 he was one of the royal commissioners in charge of the Domesday survey, which records his 210 manors. He died between September 1093 and September 1100 and was buried in Tutbury Priory. His first three tranches of land came to him from dispossessed English holders. First, in about 1066 or 1067, he was granted the lands of Goderic, the former sheriff of Berkshire, in Berkshire and Wiltshire. Then, by about the end of 1068, he obtained lands in Buckinghamshire, Essex and Northamptonshire, as well as more in Berkshire, that had belonged to Bondi the Staller. Finally, after the 1071 revolt, he was awarded the lands of Siward Barn in Derbyshire, Gloucestershire, Nottinghamshire and Warwickshire as well as further lands in Berkshire and Essex. Also after the revolt, he became holder of the Wapentake of Appletree centred on Tutbury Castle, which had been in the hands of Hugh d'Avranches and stretched across Derbyshire, Leicestershire and Staffordshire. Among his under-tenants were members of families believed to have come from villages near his original home at Ferrières-Saint-Hilaire, such as the Curzons from Notre-Dame-de-Courson, the Baskervilles from Saint-Martin-de-Boscherville and the Levetts from Jonquerets-de-Livet. William, probably the eldest, who inherited the estates in Normandy and was a supporter of Duke Robert Curthose. Enguenulph, keeper of Duffield Castle, who did not long outlive his father. Robert, who inherited the estates in England and was made Earl of Derby. Amice, who married Nigel d'Aubigny, the probable brother of William d'Aubigny. This page was last edited on 20 December 2018, at 05:01 (UTC).